(Carlisle, PA) The House Divided Project at Dickinson College is launching a new e-book series that features short biographies of underrated figures from Civil War era history. Forgotten Abolitionist: John A.J. 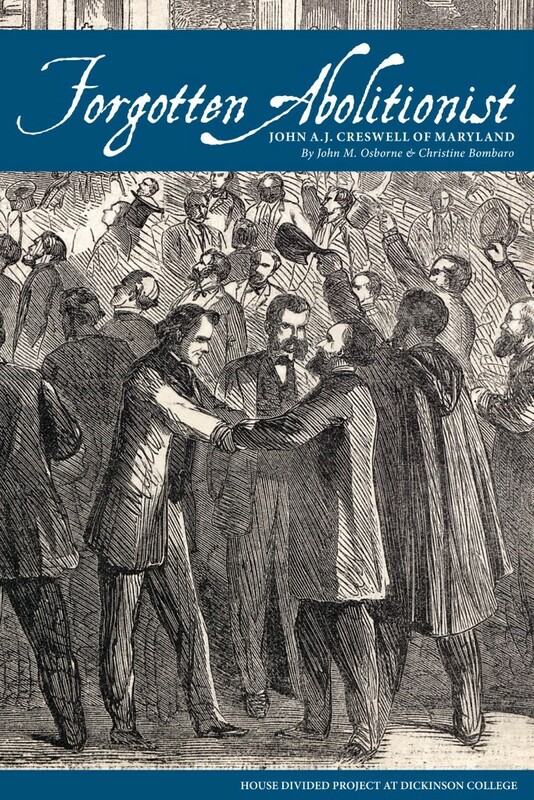 Creswell of Maryland by John M. Osborne and Christine Bombaro is the first offering in this series, currently available for free download via Smashwords. Osborne, an emeritus history professor, and Bombaro, an associate director of the Dickinson library, have been researching and teaching about Creswell (Class of 1848) at Dickinson College for years. But other scholars have largely ignored him, and he has never before been the subject of a full-length biography. Creswell did appear, however, in James Oakes’s ground-breaking recent study, Freedom National (W.W. Norton, 2013), and Oakes, who serves on the board of scholarly advisors for the House Divided Project, helped review the manuscript. Sunday, December 6, 2015 marks the 150th anniversary of the ratification of the Thirteenth Amendment. It might be a good day to download a free copy of Forgotten Abolitionist. This academic year (2015-16) also marks the 10th anniversary of the House Divided Project, which will be celebrated on campus from March 24-26, 2016.